Rates at the newly renovated rooms start at $139. Daily resort fees at the Bally’s Las Vegas Hotel & Casino are $29 plus tax for 2019 NAB Show registrants- that’s 17% off! Rates at the newly renovated rooms start at $119. Daily resort fees at the Flamingo Las Vegas Hotel & Casino are $29 plus tax for 2019 NAB Show registrants- that’s 17% off! 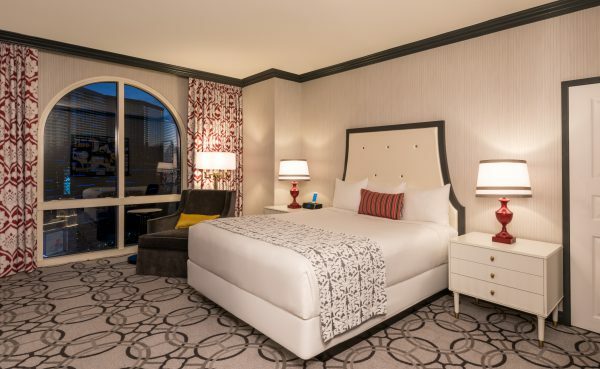 Rates at the newly renovated rooms start at $119. Daily resort fees at the Harrah’s Las Vegas Hotel & Casino are $29 plus tax for 2019 NAB Show registrants- that’s 17% off! Rates at the newly renovated rooms start at $159. Daily resort fees at the Paris Las Vegas Hotel are $32 plus tax for 2019 NAB Show registrants- that’s 14% off! Rates at the newly renovated rooms start at $145. Daily resort fees at the Planet Hollywood Las Vegas Resort are $32 plus tax for 2019 NAB Show registrants- that’s 14% off! This hotel provides complimentary shuttle service to-and-from the Las Vegas Convention Center during the Show. Expovision is the Official NAB Show Hotel Reservation Office. To learn more about the official room block, visit nabshow.com. If you’ve been contacted by a hotel scammer, please report them to nabhotels@expovision.com. Please note: Rates and exhibitor suite availability are as of 11/19/2018 and are subject to change until booked.